All Three Movement Books in One! 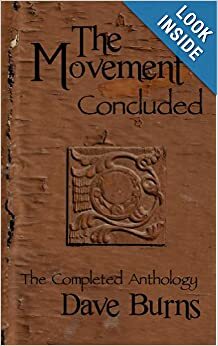 The Movement: Concluded is a completed anthology of The Movement Series including the works: The Movement: A Children’s Story for Grown-ups, The Movement: Revisited, and Edem’s Flight. Told through the voice of a paternal narrator, the stories take on a whimsical, magical feel. The Movement follows the journeys of Tick, the little clockwork man, through a wondrous land to find the Maker and discover the truth behind the cruel joke. The Movement: Revisited brings us back to that marvelous land, and chronicles the story of those left behind in the wake of Tick’s departure. Edem’s Flight is the spiritual successor to The Movement Series. It is the story of our dear friend following a single grain of sand across the desert dunes to the promise on the other side. I love this book. The author has such a flair for writing that every paragraph is described in such detail that the reader can easily picture whatever is being portrayed. Each anthology is a magical, whimsical adult version of a Disneyland or Oz type tale that keeps the reader enthralled. I did not want to put the book down. I would recommend this feel better book to all adults. You will be whisked away from the daily grind to a colorful wonderland. Don’t miss it. This entry was posted in Uncategorized and tagged a million little gods, a million little gods: the clearwater chronicles, Alice in Wonderland, Amazon, Amazon Recommended Fantasy, Amazon recommended Science Fiction, and the Wardrobe, book, C.S. Lewis, Compilation, Dave Burns, Disney, free, John Bunyan, Kansas, Kindle, Lewis Carroll, Ottawa, Pieces of Me, Pilgrim's Progress, The Chronicles of Narnia, The Lion, The Movement, The Movement Series, The Movement: A Children's Story for Grown-ups, The Movement: Concluded - The Completed Anthology, The Movement: Revisited, The Ottawa Writers' Guild, the Witch, The Wizard of Oz, Through the Looking-Glass, UnApologetic, Uncarved, Uncarved: The Literature and Arts Magazine, Uncarvedbooks, Whimsy. Bookmark the permalink.